Jenna at JMill Wanders is hosting the Take Back Your Shelves Readathon this holiday weekend! Since this coincides with the last few days of my own Big Book Summer Challenge, the timing is perfect! 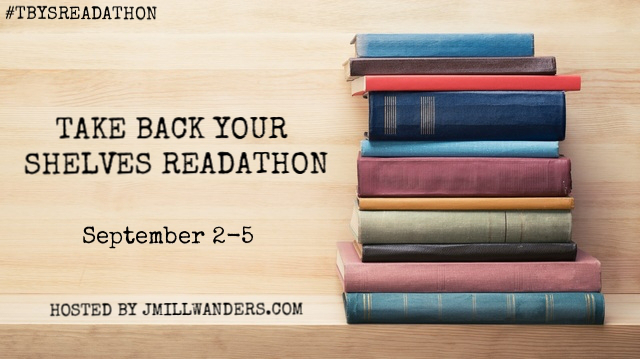 The Readathon runs from today through Monday (a holiday here in the U.S.). Though its focus is on reducing that TBR pile, I will be reading just ONE book from my TBR shelves, The Many Lives of John Stone by Linda Buckley-Archer. I'm only about 80 pages into this 500+ page YA novel, so if I can just finish that, I will be very happy! I am also currently listening to The Summer Guest by Alison Anderson on my iPod, so I will work on that, too. How much reading time I will actually get this weekend is anyone's guess! I pictured a quiet weekend with just my husband and I (he says he will participate in the readathon, too), but our older college-aged son has been home sick all week. That means the TV has been on a LOT, and we have been keeping him company watching our favorite shows together. We thought he had the flu (which, with his chronic immune disorder could be very serious), but we just heard today that he has strep throat. So, he's starting antibiotics, and we are hoping they will help to get him back on his feet. So, depending on how things go this weekend, the Readathon could be competing with either binge-watching TV or moving him back to college (or both). Anyway, I'm going to try to read more than usual...and maybe even finish one last Big Book of the Summer! Thanks for hosting, Jenna! Head over to the readathon sign-up page to join the fun yourself! Good luck with the readathon this weekend. I'd love to get in one more big book too, but I don't think I'll have that much time to read this weekend as I'm playing catch up on blogs and housework.